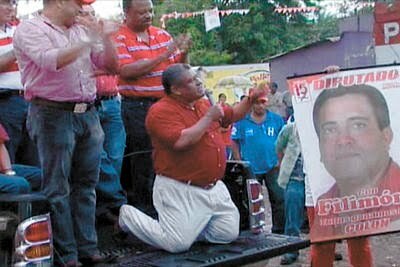 to see the photo of a mayor in Honduras literally –on his knees– begging forgiveneness of this town for backing Mel Zelaya. Honduras today said, We will have our republic! Hondurans were effusing pride in their country today in Miami Florida where thousands of Hondurans resident in Florida came to vote in the elections scheduled for today, November 29, 2009, ever since they were formally announced on June 1, 2009 by the independent Tribunal Electoral Suprema. The only protestors that still wanted their dictator Zelaya back in power were two lone fellows holding their posters and the Honduran flag across the street. Hondurans today showed an enthusiastic repudiation of the efforts of chauvinist socialists who want to force their tyrannical ways down our throats, but Hondurans spit it back in their faces today! The world fought the Law and the Law won!! In the words of one CNN reporter, Zelaya’s prediction of at least 75 percent abstention is turning into a 75 percent exercise of the vote. Even CNN, which has actively tortured their reporting to twist the true perspective of events in Honduras, has had to recognize the facts on the ground in that country. The world has saved itself from looking totally foolish. Not even all the range of international news agencies that cooperated with the lies against Honduras throughout all this, could hide anybody from the fact that the proper legitimate civilian government of Honduras, and the massive majority of Honduran people, were going to have their republic and that’s that. It was either invade and get a bigger problem, or let Honduras handle its own affairs.